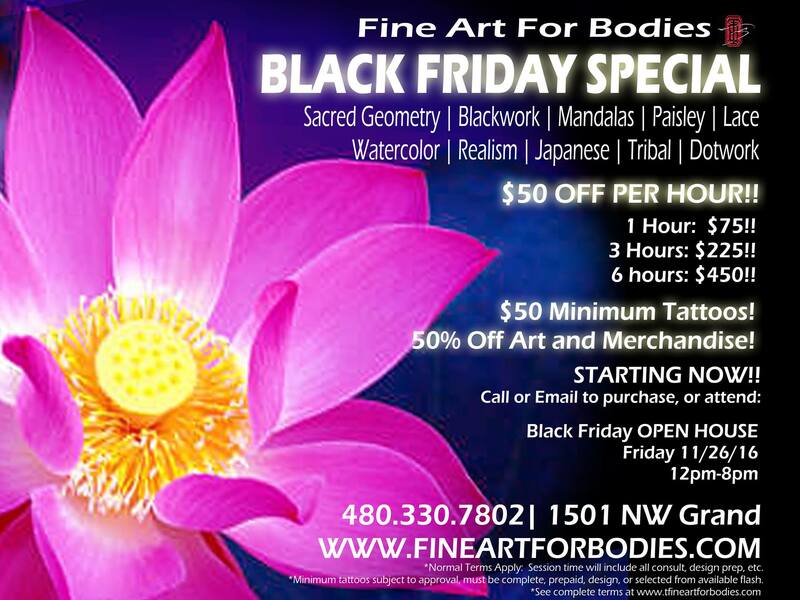 BLACK FRIDAY TATTOO SPECIAL! $50 OFF PER HOUR BOOKED!! Serious savings to say thank you for serious customers. I would like to take a moment to remind you all of my Black Friday Tattoo Special tomorrow! You can receive 40% off of tattoo services: that’s $50 OFF per hour! That brings rates down to $75 per hour- that’s like 1979 rates!! So if you’ve been wanting to get tattooed, haven’t had the funds to get started, have works in progress that are going slowly, or are saving , take advantage now to save a LOT of money. And please, SHARE SHARE SHARE! As long as I’ve got your request in by Friday, you’re good for the discount. You’ve got till Friday! Let me hear from you! Thank you so much! Happy Thanksgiving and happy close to your 2016! !